June 15, 2010: The Pyractif farmhouse in Bertren is very comfortable and I was fortunate again to have a single room, the Charly Gaul Room—perhaps a sign that my climbing would improve for the remainder of our time in the Pyrenees! It was also a chance to get laundry done, look after our dirty bikes and finally get our shoes dried out. There were great piles of cycling magazines and beer in the fridge and World Cup games on the big screen television, but I was determined to get out on the bike again as the previous day's 33 kms of riding was simply not enough. The weather looked fair enough, although overcast, so with a small intrepid group of seven (Martin, Terry, Greg, Brett, Dr. Chef, Daniel and myself), we headed out on our nice clean bikes southwards along the D125 towards Bagnères-de-Luchon. The road was a bit more heavily-travelled than we had been used to on the trip, but there was a bike lane marked alongside the road for a good part of the ride. We rode in a paceline and I was surprised at how good my legs felt. I was getting used to the everyday hard riding—it was just too bad that I could not have ridden the Tourmalet towards the end of the week! We reached Luchon in good time, and stopped at an intersection where large banners marked where the 2010 Tour de France would come through. The Col de Peyresourde would once again play an important role in the contest and the profiles shown on the banner were pretty daunting. But our goal was a single pass today, and crepes on top! Turning right onto the D618, we gradually began our climb. At this point it began to rain very lightly, and Terry had had enough of being soaked this week, understandably, so he turned back towards Luchon. The rest of us rolled upwards, past Trébons-de-Luchon, the intersection that would have taken us towards the Port de Balès. The hammerheads in the group had decided to try and do that pass today and then continue onwards to the ski resort of Superbagnères, but our little group thought that the Peyresourde was plenty for a rest day! We continued onwards in light rain, past charming ancient dark stone villages. Eventually the villages were no more to be seen. 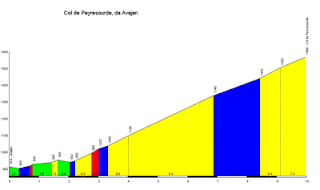 The Peyresourde was one of the climbs included when the Tour came to the Pyrenees in 1910. It is almost 10 km long, with an average grade of 6.6%, with some nasty bits pushing nearly 12%. I was careful to ride without putting too much pressure on my inner thigh muscles and enjoyed the hairpins and the views of the surrounding green countryside. As we were finishing our crepes, we were joined by Mr. & Mrs. Badger, who were looking pretty wet. Of course, while we were eating, the rain had increased and now it was pouring. Nothing to do but head out and downhill. The first third of the ride back to Luchon was not very nice, although not nearly as cold as the Aspin descent had been. I was the first one down and waited for everyone at the intersection, where, sure enough, I began to shake with cold again. This was getting tiresome, but soon we found a caféand were recovering with hot drinks. We found our hammerheads, who told us that the Port de Balèhad been pretty hard to ride, as the road surface was poor and covered with cow or sheep manure. It would have been no fun in the rain. There was a bike shop next to the café, and I was happy to go in and get my Peyresourde borne, the replica miniature kilometer marker, to add to my small collection. Well, “collection” is an overstatement as I only have one from the Col du Granon. Anyway, task completed, I rode out back towards Bertren, accompanied by Duck. The weather now improved and we rode back in mild sunshine, stopping for a few photos in front of a very old church. By the time we got back, our clothing was dry (except for the shoes of course). It had been a good day, with 80 kms on the road, and 1500 vertical meters, and the weather forecast for the coming days was indicating a big improvement.